Third Iron is pleased to announce another great integration of our API suite with Explorit Everywhere! from Deep Web Technologies. Explorit Everywhere! provides a powerful way to tie together your databases – whether they are subscribed, public, catalog or internal so that you can create a time-saving and customized experience for your users. Explorit Everywhere! aims to provide a comprehensive view of available content and offers powerful tools for post-search filtering and sorting to help users drill down to the most appropriate content for them. BrowZine’s integration into the interface provides an added degree of serendipity to the discovery process by showcasing, in just one click, the article that was found in its original published context. 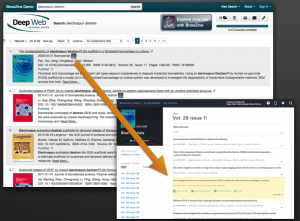 Additionally, BrowZine’s integration helps quickly acclimate the resarcher to the sources being used in the result set by integrating BrowZine’s cover image library right into Explorit Everywhere! Users can then browse that issue to find content that may be highly related to the original search, add a new-found journal to My Bookshelf to keep up to date with that title via new article alerts or even dive deeper into serendipity by exploring other journals sorted into one of BrowZine’s more than 1,000 subject categories. You can see a demo of Explorit Everywhere! working with BrowZine as well as contact Deep Web Technologies to learn more about their service. Already have Explorit Everywhere! and want to turn on this great new integration? Contact us and we would be happy to assist! See also Deep Web Technologies’ post about our partnership!